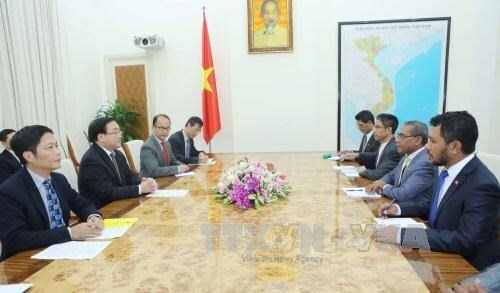 Hanoi (VNA) – Vietnam and Timor Leste hold huge potential for cooperation, especially in agriculture, tourism, services, energy, health care and education, according to Deputy Prime Minister Hoang Trung Hai. Receiving Timor Leste Minister of Commerce, Industry and Environment Constancio da Conceicao Pinto, in Hanoi on December 21, the Deputy PM said he hopes the Vietnam National Oil and Gas Group and the Timor Leste National Oil Group to implement future cooperation activities. In response, Pinto said Timor Leste is focusing on developing agriculture, fisheries, mining and tourism and wants more investors from Vietnam to visit and seek business cooperation opportunities in the country. Earlier the same day, the Ministry of Industry and Trade and Timor Leste’s Ministry of Commerce, Industry and Environment signed a memorandum of understanding on rice trade.